July 31st is Black Women’s Equal Pay Day, the day that marks how long into 2017 an African American woman would have to work in order to be paid the same wages as her white male counterpart was paid last year. Black women are uniquely positioned to be subjected to both a racial pay gap and a gender pay gap. 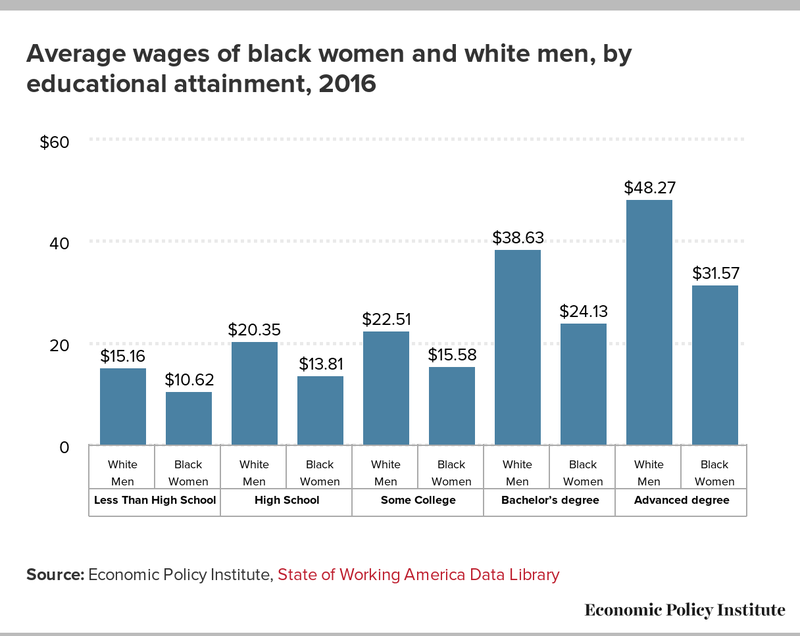 In fact, on average, black women workers are paid only 67 cents on the dollar relative to white non-Hispanic men, even after controlling for education, years of experience, and location. In the last 37 years, gender wage gaps have unquestionably narrowed—due in part to men’s wages decreasing—while racial wage gaps have gotten worse. Despite the large gender disadvantage faced by all women, black women were near parity with white women in 1979. However in 2016, white women’s wages grew to 76 percent of white men’s, compared to 67 percent for black women relative to white men—a racial difference of 9 percentage points. The trend is going the wrong way—progress is slowing for black women. Among lower paid workers, the growth in annual hours is larger for black women than for white women and men. This trend is particularly striking for the lowest wage workers. In the bottom fifth, annual hours for black women grew 30.1 percent (from 1,162 hours/year to 1,511 hours/year) between 1979 and 2015 compared to a 27.6 percent increase (from 1,086 hours/year to 1,386 hours/year) for white women and a 3.2 percent increase (from 1,553 hours/year to 1,602 hours/year) for white men. Working moms are significant contributors to this trend—half of all African American female workers are moms, as are 55.3 percent of Hispanic working women and 44.5 percent of white female workers – although women often face a wage penalty when taking time out of the workforce to care for children. 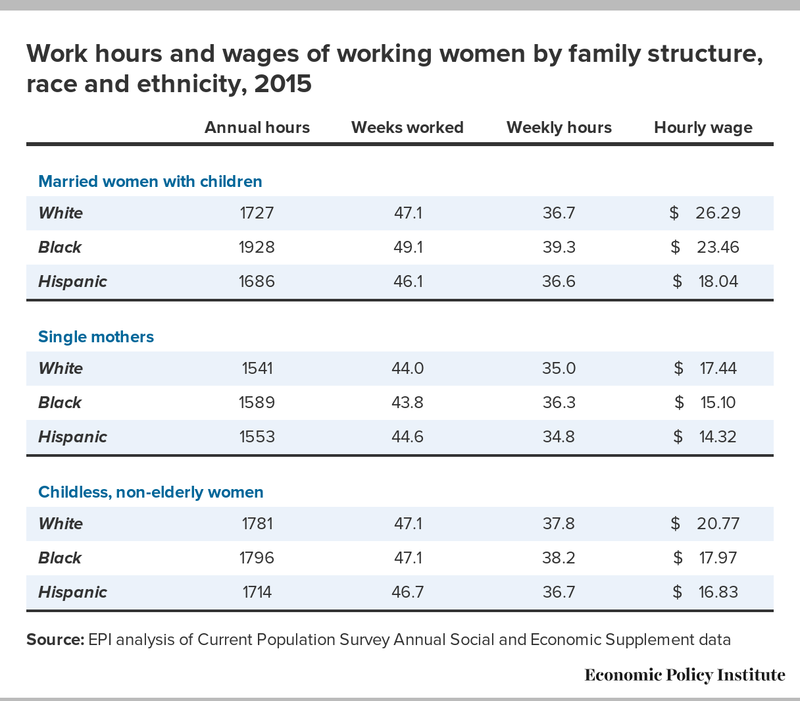 While all moms are working more hours per year and contributing more to their households financially, African American working moms are uniquely central to the economic well-being of their families. 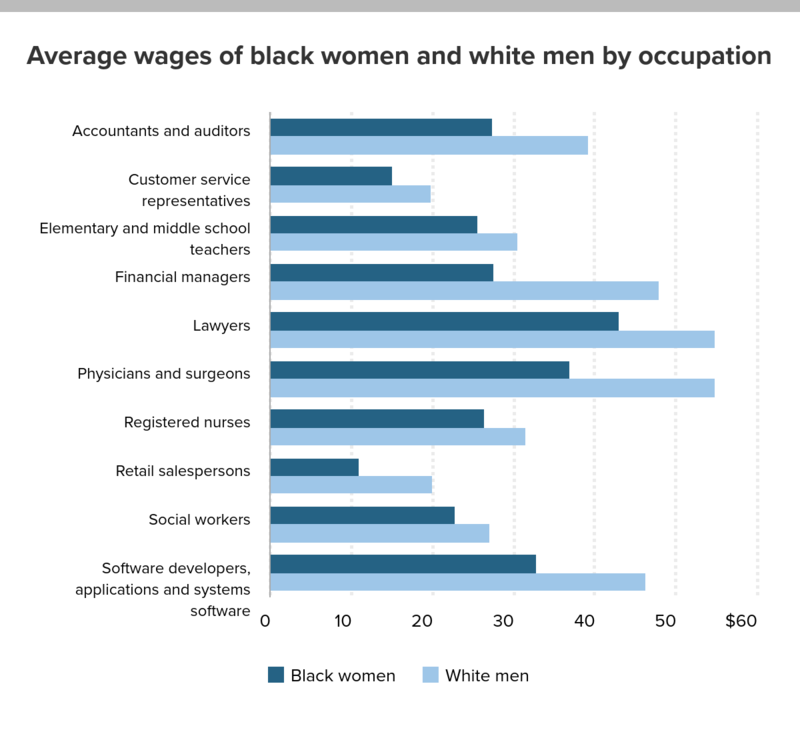 The data make it clear that there has been no lack of effort on the part of black women workers. Even in the face of persistent racial wage gaps, labor market discrimination, occupational segregation, and other labor market obstacles, black women continue to increase their annual hours and weeks worked per year. The truth: In almost every occupation—both female-dominated and male-dominated—black women earn less than white men. As black women continue to be over-represented in low-wage jobs, policies that lift wages at the bottom will have a significant impact on their wages. An increase of the federal minimum wage to $15 by 2024 would affect more than one in four black women workers.